Axel Botticelli teamed with fellow junior Jack Kostrinsky to win the Mountain Region doubles championship last week, giving the pair the chance for the Class 4A state doubles crown this weekend in Reno. 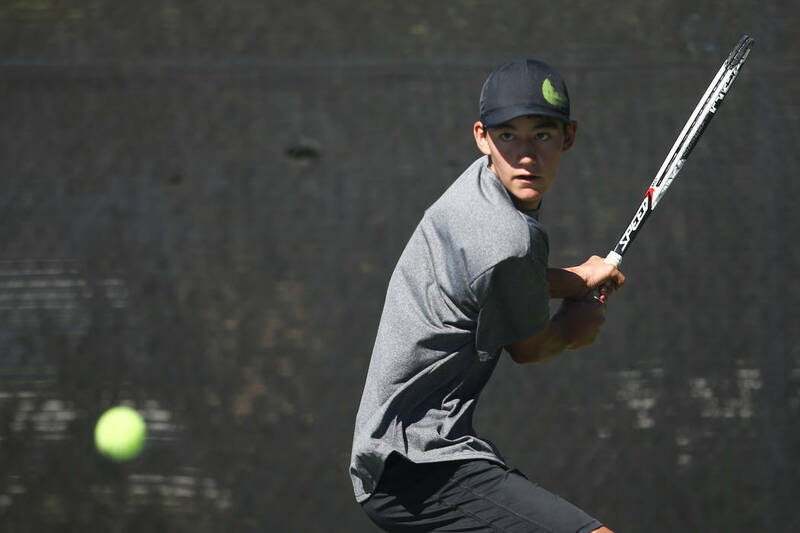 Palo Verde junior Axel Botticelli approached Panthers tennis coach Richard Coop before the season and revealed he had no interest in winning another Class 4A state singles championship. Botticelli teamed with fellow junior Jack Kostrinsky to win the Mountain Region doubles championship last week, giving the pair the chance for the Class 4A state doubles crown this weekend in Reno. Team tournament play begins locally on Monday and concludes Friday in Reno. The singles and doubles play concludes Saturday. Botticelli and Kostrinsky play year round in junior events and have known each other since they were 11 or 12, they said. Both are nationally ranked in their class, per the Tennis Recruiting Network, and are standout singles players for the defending Class 4A team champion Panthers. Botticelli breezed through the Class 4A singles bracket last year and surprised himself with an upset victory over Clark’s Artem Iermolov in the championship match, but knew shortly after the season he wanted to try something else. “I just wanted to get a doubles (title) in this year because I like doubles,” Botticelli said matter-of-factly. So five-star prospect Michael Andre assumed Palo Verde’s No. 1 singles spot, and Botticelli and Kostrinsky played mostly singles throughout the regular season for the unbeaten Panthers. Their familiarity helped them mesh on the doubles court and they dominated the Mountain Region tournament in preparation for state. Coop marveled at Botticelli’s unselfishness and said he and Kostrinsky, as captains, are model leaders for the rest of their teammates. The NIAA is uneveiling its new six-team tournaments this year, and tennis is the first sport to play its championships. The Northern and Southern region champions have byes into the semifinals, which are Thursday. The other four teams — three Southern and one Northern — will play first-round matches for a berth in the semifinals.